The terrible amnesia to which humankind is prey is undoubtedly one of the principal causes of our inability to learn from history. The invasion of Occitania and particularly the massacre on 22nd July, 1209, of the 20,000 inhabitants of Béziers on the pretext that the town harboured 230 heretics whom the town council refused to hand over to the Crusaders, dramatically recalls similar events in modern times, such as the Spanish Civil War triggered in 1936 by Franco's army with the excuse of the Communist threat and the division of Spain, the invasion of Czechoslovakia in 1939 with the excuse of the Sudetenland, and the invasion of Poland by Hitler's German troops, in September 1939, over the question of Gdansk. More recently, we remember the wars in Vietnam (1958-1975), Afghanistan (2001), those launched in retaliation against the terrorist attacks of 11th September, and the Iraq war (2003) with the excuse of that country's supposed possession of weapons of mass destruction. Just as the laws promulgated by Pope Innocent IV in his Bull on torture, Ad Exstirpanda of 1252, contemplated all the methods of accusation with no possible defence (still in place today at Guantanamo) and authorized torture as a means of extracting information from heretics, so do countries ruled by dictatorial and unscrupulous regimes today still deny the rights of those they accuse. Punishment was meted out not just to those convicted of heresy, but also to those accused without being sentenced, by the demolition and the very destruction of the foundations of their houses, a procedure still used today against the houses of Palestinian terrorists. Absolute evil is always the evil inflicted by man on man. That is why, in common with François Cheng, we believe that "it is our urgent and permanent task to unveil the two mysteries which constitute the extremes of the living world: on the one hand, evil, and on the other, beauty. For what is at stake is no less than the truth of human destiny, a destiny which involves the very foundations of our freedom." Eight centuries have passed, and yet the memory of the crusade against the Albigensians has not been erased. Even today, it evokes sorrow and pity. Leaving myth and legend aside, the destruction of the memory of that remarkable civilisation which was the "land of Oc", destined to become a truly forgotten kingdom, and the terrible tragedy of the Cathars or "Good Men" and their witness to their faith, deserve our unreserved respect and determined effort to preserve their historical memory. 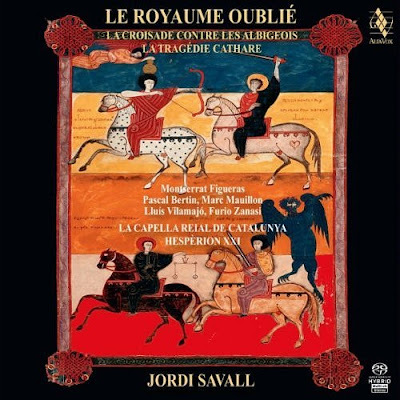 Frankly I find it very difficult to add anything to that extract from Jordi Savall's introductory essay to his latest project The Forgotten Kingdom - The Albigensian Crusade, but I will try. 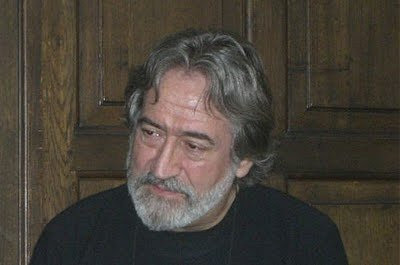 Jordi Savall is seen above, photographed during my just-in-time interview with him in 2008. Scholarship, musicianship and production excellence are givens for any of his projects and this new release, which documents in music and texts the Albigensian Crusade of the 13th century, is no exception. Three CDs come in a sumptuous 560 page book and in addition to the constant of Hespèrion XXI there are guest musicians from Armenia, Turkey, Bulgaria and Morocco. But there is something else that makes the The Forgotten Kingdom exceptional. One only needs to read the Ad Exstirpanda to discover that the inquisition [against the Cathars] was not about faith and not even about heresy, but about wealth and power, and the crudest method of attaining these - terror. In the Middle Ages multinational armies, the Crusaders, were used to attain wealth and power. It is not difficult to see similarities between those armies of long ago and today's multinational media conglomerates, who seek wealth and power by restricting choice and establishing a monoculture of modernity. Free thinking is today's heresy, and it will surely not be long before those who swim against the tide meet the same fate as the Cathars of Béziers. The Forgotten Kingdom is an important reminder, in both historical and contemporary contexts, of the importance of protecting the foundations of our freedom. Through music and texts documenting the tragedy of the Cathars, a group who dared to swim against the tide, we are reminded how wealth and power corrupts. And through the singular commitment of a group of artists working outside the media controlled celebrity circuit with a musician owned independent record label we are reminded of the true price of today's monoculture of modernity. Swimming against the tide has always been deeply unfashionable. But is that tide turning? The Norfolk & Norwich Festival has a long and distinguished history, and its commissions include works from free thinkers such as Benjamin Britten (Our Hunting Fathers), Ralph Vaughan Williams (Five Tudor Portraits) and William Alwyn's (Fifth Symphony). In recent years the Festival's headline acts have included, as reported here, others who swim against the tide, including Jacques Loussier, the Hilliard Ensemble and last year Philip Glass. In 2010 the closing concert of the Festival is not EMI's latest Chinese pianist or Sting's latest supermarket merchandised blockbuster. In another blow against the monoculture of modernity the closing concert is the UK premiere of Jordi Savall's Jerusalem, and the volume of early ticket sales suggests that swimming against the tide may just be coming back into fashion. * In another of the excellent essays in The Forgotten Kingdom Antoni Dalmau reviews how history has treated the Cathars and cautions against some recent fictional treatments. But the National Socialism's fascination with the Albigensian movement cannot pass unremarked, read more here. * This blog is also guilty of capitulating to the monoculture of modernity, which means Amazon is usually cited as the default source for CDs. So it is worth noting that I bought The Forgotten Kingdom from Prelude Records for £27.99, the amazon.co.uk price is £36.89. 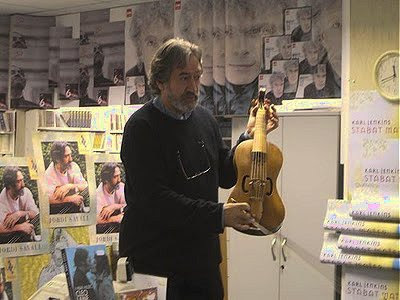 That is Jordi Savall in Prelude Records in the photo above which comes from my post The tills are alive with the sound of early music. * The terrible Albigensian Crusade started from Nîmes, which featured in one of my road trip posts. Another commission for the Festival, I understand, is Arve Henriksen, who will be writing a piece for community choir and performing it with them. Both events sound worth travelling from the other side of the country to hear. The download of The Forgotten Kingdom from amazon.co.uk costs £13.98. But if you buy it that way you will succumb to the MP3 monoculture of modernity and thereby miss out on an awful lot. The massacre of Beziers was appalling and must lead one to ponder the problem of evil, but need our respect for the Cathars be 'unreserved'. People are overly sentimental about the Cathars. The Cathars let their definition of the perfect be the enemy of the good: their attitude to the truly human aspects of life was puritan. Not unlike the Communists in Spain, perhaps. The Republicans were not backward in butchery. The slaughter of priests, nuns, and Catholic laypeople just for their faith is often forgotten. I'm sure Jordi's music here is as wonderful as it always is, but I'll keep my respect for the Cathars reserved to their, admittedly sublime, status as fellow humans, not their Catharism. Shadrach, you make a very good point and deeper study of the beliefs of the Cathars does indeed make illuminating and disturbing reading, as does the Nazis interest in the sect. The value of projects like The Forbidden Kingdom is their power to make us think for ourselves and to prompt us to make up our own minds. This is in sharp contrast to today's mainstream media which tries to do the thinking for us and to get us to accept someone else's opinion. The response and diversity of views on this post on the, let's face it, fairly arcane topic of the Albigensian Crusade is heartwarming. It is also yet more proof that there is an alternative to the monoculture of modernity. John Cale is also appearing at the Norfolk & Norwich Festival this year. Thanks for such a insightful piece, Bob. One small correction... Jerusalem isn't the closing gig of this year's NNF but the last night of our residency at the Theatre Royal on 15 May. Festival closes on 22 May and there are plenty of great classical and contemporary performances in the second week, including Academy of Ancient Music (St Andrew's Hall on 18 May), Louis Lortie playing Chopin's Etudes and Nocturnes (St Peter Mancroft on 19 May) I Fagiolini (with their Tallis in Wonderland project at the Roman Catholic Cathedral on 20 May), and as mentioned Arve Henrikson and Jan Bang with the Voice Project with our latest commission for the choir, Recording Angel (at Norwich Cathedral on 21 May). Check here for more info.